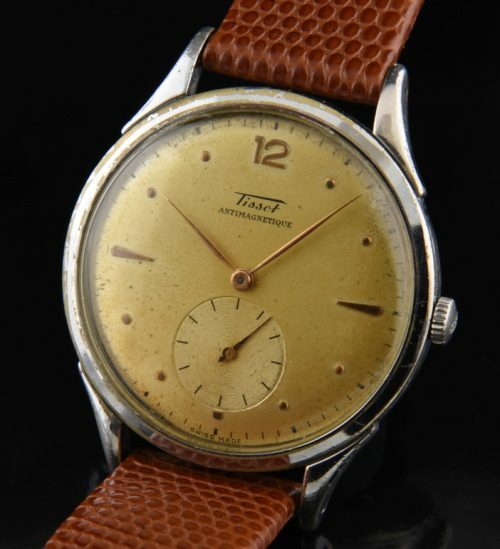 Home / Shop – Vintage Watches For Sale Used & Antique / Uncategorized / Tissot Antimagnetique 1950’s massive 38mm. This is a massive and fantastic looking vintage 1950’s TISSOT watch having a sprawling 38mm. chrome case with stainless steel back. The original dial with needle hands and raised metal Arabic numerals has aged evenly and looks great. This watch looks VERY large due to the narrow bezel. The signed correct TISSOT crown is still present. In my photo, the chrome plate looks much more worn due to the close-up and bright lighting. In person, this case really looks excellent and any wear is barely visible. You are going to love this huge TISSOT!